Cockroaches are amazing, gross pests that have been around way longer than humans in general. These insects can practically survive anything, and now you can make one into your own personal cyborg project. A neuroscience startup called Backyard Brains is looking to you for help to convert the everyday water bug into a Bluetooth controlled "bug-borg." 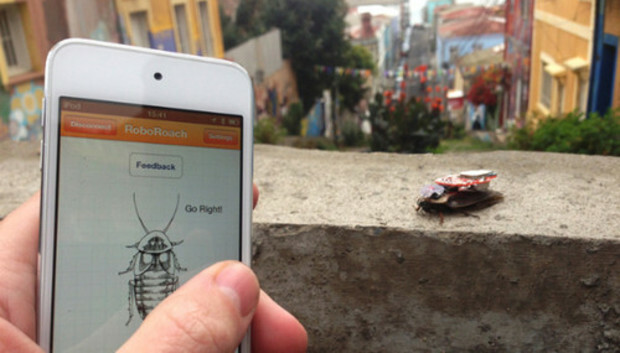 To this end it's started a RoboRoach Kickstarter campaign to bring remote-controlled cockroaches to the public. The RoboRoach project boils down to fitting a small electronic "backpack" onto the back of an unwilling arthropod. But before you can start remotely controlling the cockroach, you also have to perform some surgery that includes snipping off parts of its antennas and attaching an electrode to its noggin. Suffice to say, this is not a project for the squeamish, and it's definitely ethically questionable, even if it means harming a common household pest. The system works by sending small electrical pulses to stimulate the nerves on the cockroach's antennas. Typically, a cockroach uses its antennas to know when it's knocked into something. Backyard Brains's cockroach control system zaps this natural system with electrical "spike" signals that tell the insect to move about according how you swipe around on the connected iPhone app. If you're a consummate GeekTech reader, you might have seen some similar thinking caps attached to cockroaches or mice before. The Backyard Brains team says it wants to take the science out of the neuroengineering lab and bring it to the public to find new uses for the same brain-stimulating technologies used to treat Parkinson's disease and deafness. This is Backyard Brains's third Kickstarter Project. Previously, it ran a successful campaign to fund a published research paper the team wrote on neuroscience experiments. Since then, the team has been developing it's own custom boards and experiments. Now, Backyard Brains hopes to garner some Kickstarter support to help complete its RoboRoach system, as well as allow it to make a bulk order on custom PCBs. If you want to get to turning your cockroaches into cyborgs, pledges of $100 or more will get you a surgery kit consisting of a PCB "backpack," a battery, and three sets of electrodes that's good for up to three roaches.